There are few things as exhilarating as scuba diving and water sports, right? But if you’ve done this a few times you must know safety is a priority. Then you understand the importance of adding dive gloves to your diving gear. Whether you’re looking to go scuba diving or simply sailing, there’s a pair of gloves to ensure you’re adequately prepared for the occasion. We took the liberty of putting together information to help you select the best dive gloves for your upcoming diving expedition. 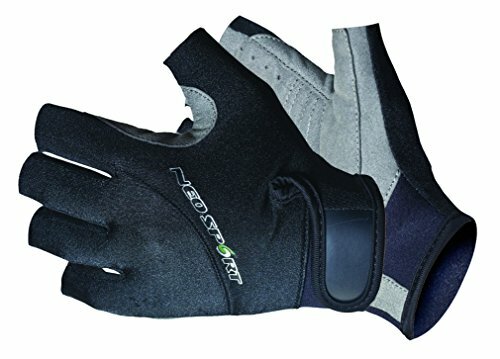 Just like buying the best dive computers, choosing a pair of dive gloves gets even more complicated if you do not get the fundamentals right from the get go..
With all the dive gloves out there, buying the right pair can be a daunting task. Where do you begin? What’s important to me? Are you looking for comfort or style? Do you value a perfect fit over warmth? Let’s discuss these to help you make your selection. The last thing you want is a pair of gloves that draws your attention from the main experience because they’re uncomfortable. Are they a good fit? If you’re looking for comfort you have to consider adjustable straps. The two most common options are Velcro and a hook and loose fastener although there are various designs to select from. If they’re too tight, you might end up with small blisters after your dive. TIP: You can always pull your wetsuit over your gloves for a snug fit. Taking into consideration the degree of dexterity of the gloves before making a purchase is important. Are you able to move your fingers while wearing the gloves? For instance, you might need to wipe water from your mask every now and again. Will the gloves allow you to adjust any straps when need be? Below are a few designs to consider. Five finger gloves: These gloves mimic the shape of your hand and make it easier to move your hand. Mitten design: This design enables heat retention by keeping your fingers close together. Solid wrist design: Though these are more uncomfortable to wear, they‘re effective in keeping water out. What Are the Benefits of Dive Gloves? To make sure you spend your money wisely, it’s important to know what you’ll be getting out of the gloves before making a purchase. Did you know the first parts of your body to feel cold after staying long in water are your hands? Here’s an important fact: Below 12°C, your hands go numb within 10 minutes. How do you prevent this? If you’re planning on going for a dive in cold waters opt for gloves that will provide your hands with thermal insulation thereby keeping them warm. There’s a misconception that if you’re going into warmer waters you don’t need gloves. That couldn’t be further from the truth because they’re made for other functional uses including protection. Are you planning on using a lot of strength and grip during your diving adventure? 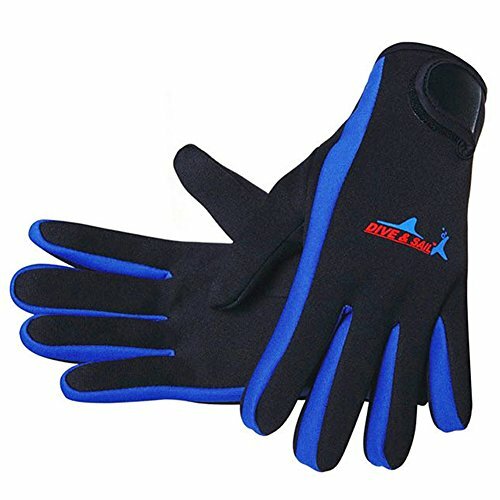 Be it grabbing rocks while exiting the sea or lobster hunting, a pair of strong gloves will make a huge difference in what you’ll feel comfortable doing. Select gloves which are specifically designed for your protection against any sharp edges or marine fauna. Dive gloves come in a variety of thickness levels between 0.5mm and 7mm. The thicker the glove the less flexible your hand becomes. Putting them on and taking them off will prove to be a challenge. Bear in mind the colder the water the thicker the gloves should be. However, if flexibility is important to you thinner gloves are your ideal pick. 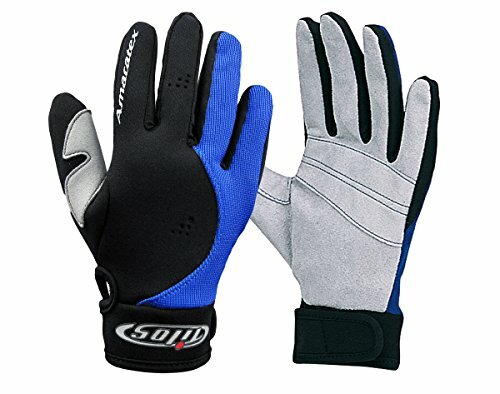 Gloves of 1mm to 3mm are comfortable to use in wreck environments without compromising on functionality of your hands. So if you’re planning to use a camera underwater thinner gloves will be ideal. Ultimately it boils down to your preference. Are you willing to sacrifice comfort over functionality? You decide. Kevlar: This material is known for its elasticity and strength. 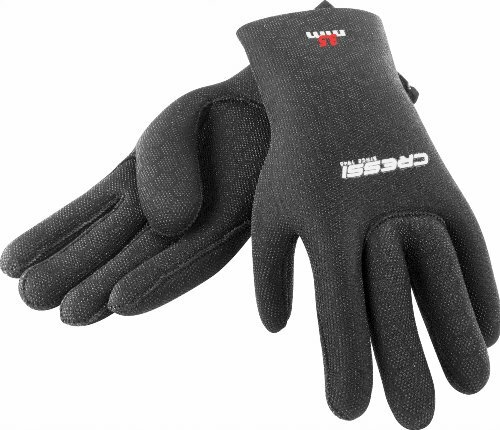 It increases the durability of gloves by avoiding premature deterioration. So if you’re thinking of not purchasing another pair in the near future, this material will be ideal. What’s the Best Way to Use These Dive Gloves? The best way to use these gloves depends on the purpose they’re intended for. We love these gloves for their versatility. Whether you’re looking to go diving, snorkeling or waterskiing they prove to be helpful. They’re made of neoprene making them soft and comfortable. If you’re into competitive sports, this material reduces hand fatigue which will go a long way in securing that win. These gloves are 5mm in thickness. This means if you’re looking for warmth and protection without compromising on flexibility they’re a wise option. Another good feature is the vented, padded synthetic leather palm which can help provide your hands with excellent grip. This feature also protects palms from abrasions (That would have been really useful when I went for a boating race last fall. My hands kept on slipping from the oars resulting in me losing the race!). They come with risk fasteners so they stay in place. 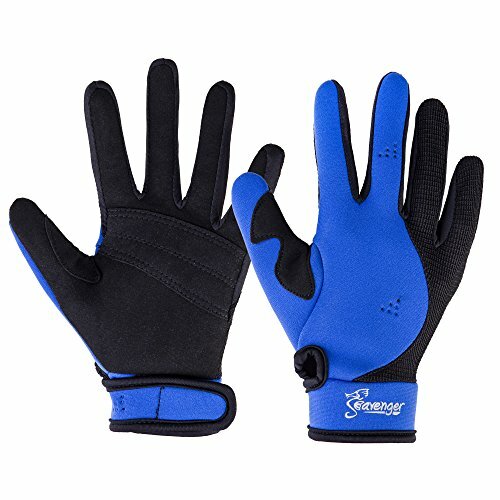 Cold weather doesn’t have to stop you from participating in your favorite water sport because these gloves are designed to insulate your hands keeping them warm. Perfect for many sports: Water sports, cycling and weightlifting and boating. If protection from abrasion is your biggest concern these Dive & Sail premium five-finger wetsuit gloves are an ideal pick. They come with a hi-grip textured palm which is designed to protect you from cuts. This is a great feature if you’re considering going rafting. This is also great for secure handling of small items like lights or slates. They have glued and sewn seams that are great for stopping water from getting into the gloves. Another good feature is the elastic closure making it easier to fit over wetsuit sleeves providing a secure seal. We also like these gloves because you can use them around the home. Whether you’re into sailing, water jet skiing or scuba diving these gloves from Tilos are very useful for all your sporting needs. This combination of material makes them durable and very strong. Another beneficial feature is the wrist band which comes with an adjustable Velcro and a hook and loop fastener which helps the gloves hold very nicely. They also come with palm and thumb reinforcement for increased strength and prolonged use. This feature also comes in handy if you’re looking to do a bit of gardening with them. The next time you plan an exploring adventure, these reliable gloves won’t let you down because of their reliability. They’re made with an Amara leather palm making them quite durable and this protects your palm against rough surfaces like rocky reefs. 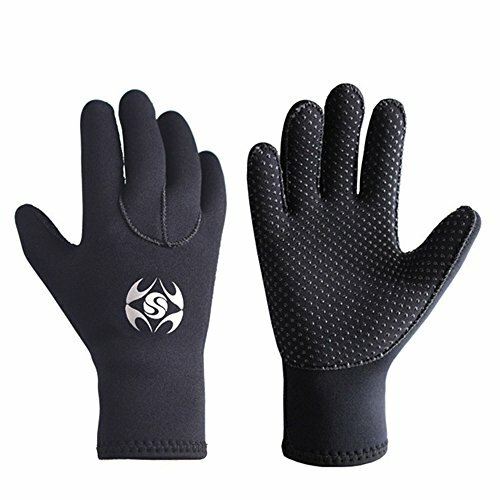 These gloves are very comfortable because they’re made with 1.5mm neoprene and a mesh-combo back. The thickness helps preserve body heat and therefore keeps you warm. Another great feature is the adjustable straps which make for a snug fit if comfort is important to you. You might also like the panel insertion because it allows for elasticity so movement of fingers is not restricted. If you’re style conscious their trendy look ensures you don’t have to sacrifice style for comfort. If both comfort and performance are important to you these could work for you. Whether you’re male, female or buying for your kids, all sizes are available. This is quite useful if you’re considering gifting anyone the perfect diving Christmas gift. We love these 5-fingered gloves because they come in varying thickness ranges. From 2.5mm, 3.5mm to 5mm, there is a type for every water environment. They‘re made from single lined soft, high stretch neoprene making it flexible. The entire surface of the glove is covered by a non-slip substance for easier grip. Another great feature is the anatomical shape and semi bent fingers which mimics the natural position of the hand for ultimate comfort and flexibility. They’re an excellent selection for scuba diving and are designed for both men and women. While all the above featured gloves are great, some products will garner more votes than others. In our opinion, the Cressi High Stretch Neoprene Diving Gloves are clear winners. This brand doesn’t limit you to one size of thickness. You’ll be able to take your pick for different water temperatures. They’re suited for all types of water sports. Their preformed hand design has to be the best feature because though it might sound cliché, it’s true; they literally fit like a glove! Not only that but they’re easier to wear and remove compared to the other gloves. Their high-stretch material makes them our favorite because you’re guaranteed more flexibility. These gloves make for great comfort and fit so well that you actually forget you’re wearing a pair. Then you’re free to focus on everything around you! Be sure to check out the related guide on dive boots here.